Ian Atkins was back at Sixfields this to look back on one of the most famous and memorable days in the Cobblers’ history, the 1997 Wembley Nationwide League Division Three play-off final win over Swansea City - and he can’t stop smiling. May 24, 2017 marks the 20th anniversary of that amazing day, when John Frain’s twice-taken free-kick flew past the despairing grasp of Swans goalkeeper Roger Freestone and into the corner of the Wembley net. That glorious moment was in the third minute of stoppage time of what had been, if truth be told, a pretty turgid affair in the late-May sunshine under the old stadium’s famous twin towers. 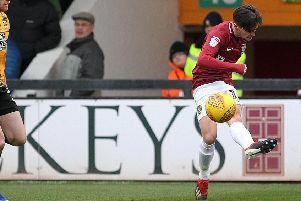 Frain’s sweet, sweet strike sent the 32,000 Cobblers fans in the famous old stadium into raptures, sealed promotion to division two, and ensured the unassuming left-back a very special place in the history books of Northampton Town FC. Atkins not surprisingly ranks what happened that day as one of his proudest achievements in a long and successful career in football as a player, coach and manager. Especially as it all happened just a few short years after the club very nearly went out of business, as well as being a goal or two away from being relegated from the Football League. “I can still picture a lot of things about the game and day, but the ending was the special bit,” said Atkins, who is now heading up the scouting network at Aston Villa. “John Frain’s free-kick was fantastic and that won us the game, but the crowd afterwards was too. “The five or six year period prior to the Wembley game and us coming in, there was the old County Ground and the people collecting with the buckets, and people giving handouts. The Cobblers would return to Wembley 12 months later, but this time suffer a 1-0 play-off defeat to Grimsby Town, and the club then had to wait 15 years before heading for the national stadium again, with the trip on 2013 being another painful one as Town were beaten 3-0 by Bradford City. So that precious win over the Jan Molby’s Swans remains the club’s only Wembley success, and Atkins says the key to that victory was the team’s preparation. “The air before the game was one of composure,” he said. “Where I think everybody gets caught with Wembley, is that they say the pitch is a sapping pitch, but it’s not a sapping pitch. “The Wembley pitch is no different to the pitch at Sixfields, it’s virtually the same size I would imagine, but it is all the build-up. “You have to be careful that you don’t use up all of your energy in the build-up, and we had a great build-up to the game. “Everything was nice and relaxed and we stayed nice and focused, we didn’t use up too much energy doing stuff that we didn’t need to do. “That was part of my job then, and we didn’t. We kept everything straight. It was pretty ridiculous for those of us having a great time out in the stands at Wembley too, with the massed ranks of Cobblers fans relishing the chance to celebrate their team’s victory at the home of football. The same ground that had staged England winning the World Cup in 1966, and countless other unforgettable football moments. And now the Cobblers supporters had a very, very special memory of their own. Following the excitement of seeing skipper Ray Warburton walk up those famous Wembley steps to the Royal Box to lift the trophy, the after-match celebrations went on, and on, and on, with supporters and team revelling in the special moment. It was unbridled joy, not just for the fans, but for the players too, who were lucky enough to live their own schoolboy dream of winning at Wembley. Nobody who was there will forget it, nor the songs that were played as the soundtrack to those celebrations, and Atkins revealed he and club staff did their bit in setting up what was to become a bit of a Wembley celebration party playlist! “We sat upstairs at Sixfields, and Wembley got in touch and said ‘if you win the game, what records do you want played?’,” said Atkins. “We came up with Rocking All Over The World (by Status Quo), Moving On Up (M People), and Simply The Best (Tina Turner). “I believe those records were then played for the next 10 years at every Wembley final for the winners, so that was something else we achieved! Staff, players and supporters partied long into Saturdaynight/Sunday morning, with the trains from Euston to Northampton packed with jubilant fans heading back into town to keep the celebrations rolling on. The Monday was a Bank Holiday, an open top bus parade was arranged - and that too is a day that has gone down in Cobblers folkore. Yet again the sun was out, and an incredible crowd, estimated to be 30,000-strong, took to the streets surrounding Northampton and in the town centre to salute their heroes, and Atkins admitted it was a special moment. “About 30,000 came out to see the open top bus parade, and we couldn’t move. “We stopped about every 100 yards so we could get another crate of beer on! Another day of partying was followed by holidays for all at the club, with the players jetting off for a week in the sun as a special reward, before the team returned ahead of what would prove to be another successful season. And although it came very close, it didn’t quite reach the heights of the 1996-97 campaign. Indeed, it’s probably fair to say that no other climax to a Cobblers season has matched that of Saturday, May 24, 1997. Yes, there have been other brilliant days, better teams, huge celebrations, and memorable achievements. Think promotion to he top flight in 1965, the promotions that preceded and followed that, the division four title win of 1987, beating Shrewsbury on the final to avoid relegation to non-League in 1993, the promotions of 2000 and 2006, and of course the record-breaking league two success under Chris Wilder in 2016. They were all huge achievements, they were all moments and days to be treasured and enjoyed, but there is something that little bit extra special amount winning at Wembley. And as the Cobblers have only done it once in their long history, that May afternoon in 1997 is up there with the greatest days of the lives of anybody lucky enough to be there. The final words go to the man who masterminded it all, Ian Atkins. “It was an incredible day, and it was an elation and the build up of 100 years of history,” he said. “For four or five years prior to that things had looked a bit rough, and it looked like the club might get relegated, especially when getting beaten 2-0 at half-time at Shrewsbury, but then coming back to win. Cobblers team: Andy Woodman; Ian Sampson, David Rennie (Dean Peer, 40), Ray Warburton, John Frain; Roy Hunter, Sean Parrish, John Gayle (Jason White, 76); Lee Clarkson, Neil Grayson, Christian Lee. Substitute not used: Ali Gibb.